When asked to name the greatest team he was ever on, Ted Williams said, “The US Marines”. Ted Williams was John Glenn’s wingman flying F-9Fs in Korea. The Boston Red Sox slugger who wore No. 9 as a major leaguer, would now be assigned to an F-9 Panther jet as a pilot. Ted flew a total of 39 combat missions in Korea. He was selected by his commander John Glenn (later the astronaut, senator, and’septuagenonaut’) to fly as Glenn’s wingman. While flying an air strike on a troop encampment near Kyomipo, Williams’ F-9 was hit by hostile ground fire. Ted commented later: “The funny thing was I didn’t feel anything. I knew I was hit when the stick started shaking like mad in my hands. Then everything went out, my radio, my landing gear, everything. The red warning lights were on all over the plane.” The F-9 Panther had a centrifugal flow engine and normally caught fire when hit. The tail would literally blow off most stricken aircraft. The standard orders were to eject from any Panther with a fire in the rear of the plane. Ted’s aircraft was indeed on fire, and was trailing smoke and flames. Glenn and the other pilots on the mission were yelling over their radios for Williams to get out. However, with his radio out, Williams could not hear their warnings and he could not see the condition of the rear of his aircraft. Glenn and another Panther flown by Larry Hawkins came up alongside Williams and lead him to the nearest friendly airfield. Fighting to hold the plane together, Ted brought his Panther in at more than 200-MPH for a crash landing on the Marsden-matted strip. With no landing gear, dive brakes, or functioning flaps, the flaming Panther jet skidded down the runway for more than 3000 feet. Williams got out of the aircraft only moments before it was totally engulfed in flames. 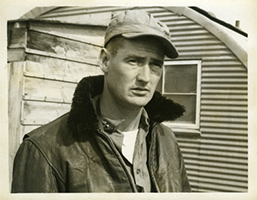 Ted Williams survived his tour of duty in Korea and returned to major league baseball. Pssst: Ted missed out flying combat missions during WW II, because his flying and gunnery skills were so good that he was kept as an instructor for much of the War. During advanced training at Pensacola, Florida Ted would accurately shoot the sleeve targets to shreds while shooting out of wing-overs, zooms, and barrel rolls. He broke the all time record for ‘hits’ at the school. Following Pensacola, Ted was sent to Jacksonville for advanced gunnery training. This is the payoff test for potential combat pilots. Ted set all the records for reflexes, coordination, and visual reaction time. As a result of his stunning success he was made an instructor at Bronson field to put Marine aviation cadets through their final paces. By 1945 Ted got his wish and was finally transferred to a combat wing, but weeks later the War was over. He was discharged from the military in December of 1945. Seven years later, in December of 1952, Ted was recalled to active duty as a Marine Corps fighter pilot.